Happy Halloween from my spooky ghost! 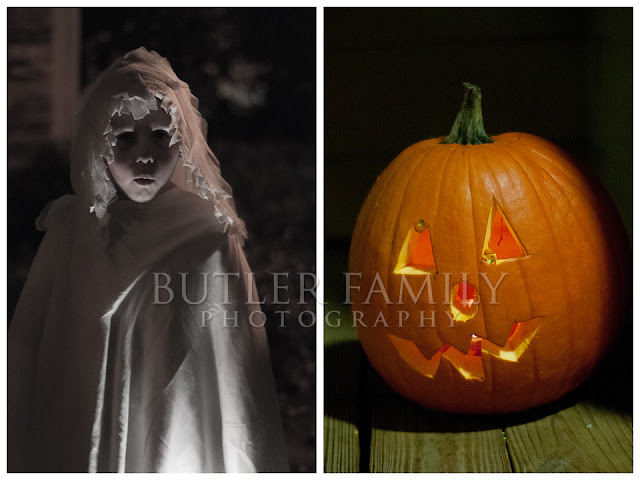 I love Halloween -- dressing up, going to parties, carving pumpkins and trick-or-treating. 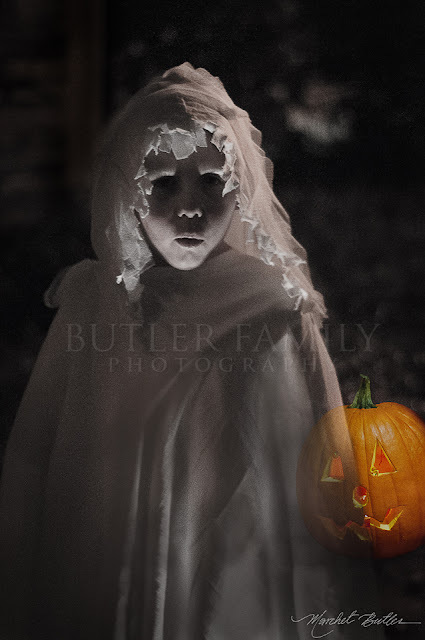 I am not into the spooky part of Halloween, but this year, my son wanted to be a ghost, and I thought it would be fun to get a ghostly image of my little guy. This is a composite image of the two photos below. And, yes, it took a while to get the flashlight positioned just right and then a good chunk of time to edit it. What do you think? Enjoy your Halloween! Photography used to be my hobby, but now it's definitely more "work" than play. So, lately, I've been going back to illustration as a creative outlet. I developed my drawing skills in high school--and it's literally been years since I've taken on a project like this. This illustration was a surprise for my friend's birthday. I borrowed a few old photographs from her daughter--you can see the image I used to the left of the illustration--and tried to go for that older vintage-portrait feel with my drawing. Thanks to my trusty camera, I can have a record of my work, even though I gave the original away to my friend today. In the future, I hope I'll be good enough to move on to pen and ink, but right now, pencil and eraser are my medium of choice (mostly because of the eraser--grin).